The town of Malitbog, located along the western shores of Sogod Bay came into existence in the early part of the 19th century. Two watchtowers or "baluarte," on which the numbers "1820" are inscribed, bear witness to this fact. However, there is a curious historical account as to the creation of this village. This is borne by the fact that these two "baluartes" are located not in the center of the present-day town, but in two barrios equidistant from the parish church. One is found in Brgy. Caaga to the south, and the other is in Brgy. Abgao to the north. According to local history, these two barangays were ruled by two rival capitanes, the names of whom have been erased from the collective memory of the townspeople. When the pueblo was later organized by the Spaniards sometime in the middle part of the 19th century, both capitanes, together with their respective villagers, vehemently refused that one or the other be made the pueblo, for each claimed to be more suited than the other. The controversy dragged on for some time. Now the word "confusing" in the Bisaya language means makalibog, and when strangers came asking for the "pueblo," people would shake their heads, point their fingers hither and thither, and say, "Makalibog." Later, with the Leyteños penchant for contracting tongue-twisting words, the place was aptly baptized "Malitbog." This did not solve the problem of where to locate the "Pueblo," however. So the Spanish missionaries who often came to visit the two rival barangays, had the solomonic wisdom of fusing the two barangays by building a common church. Again, this proved to be another problem, because both barangays claimed that the church should be built on their grounds. 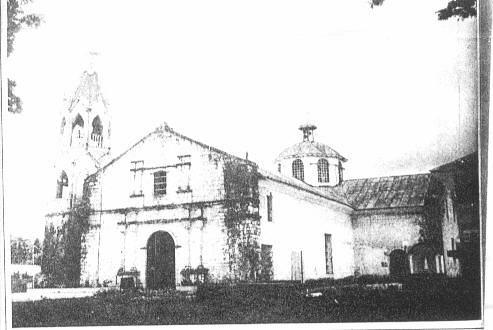 Finally, in exasperation, the Spanish friars, thundering the fear of God upon the natives, proclaimed that the church building would be built neither on the the two barangays, but on a site equally distant from the two. And it was then that in 1857, the present stone and adobe church, through forced labor, was finished to become the house of worship of all Malitboganons.